How else can I make sense of the fact that Boston’s South Station is completely plastered with Draft Kings advertising? These days one-day fantasy sports ads are inescapable, not only in places — both real and virtual — where young, male sports fans congregate, but places as universal and banal as the city train station. The sudden ubiquity of these ads — seriously, I had never heard of this concept a few months ago — should tell you something about the outrageous profitability of the one-day fantasy sports business, and the rapid ascendancy of Fan Duel and Draft Kings in particular, companies that have rocketed to prominence in the past couple of years. The most remarkable aspect of these ads is the bare nakedness of their get-rich-quick marketing strategies. 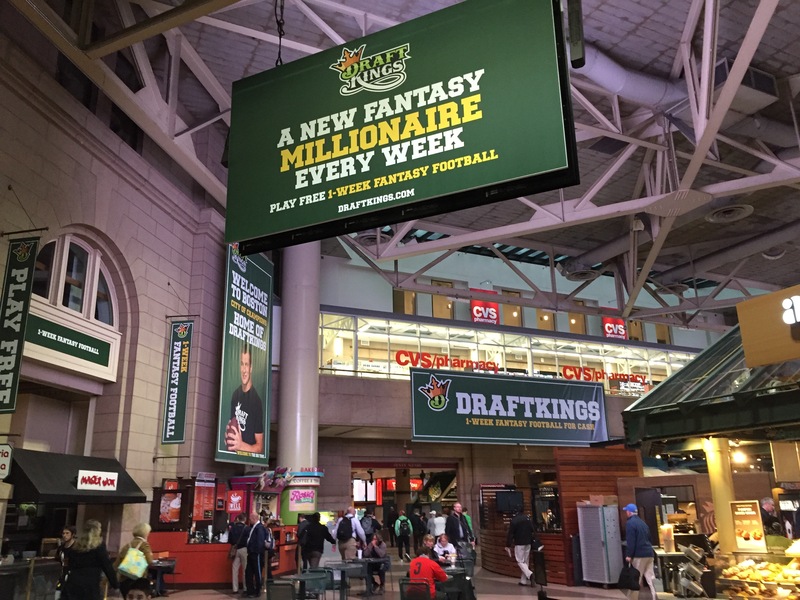 “A new fantasy millionaire every week!” declares one giant banner in South Station. “Just pick your sport. Pick your players. And pick up your cash”, reads another common tag line. The most popular contests in daily fantasy are structured as tournaments, in which only the top-scoring 10 or 20 percent of entrants win anything at all, with a disproportionate piece of the rewards going to the top overall winner out of hundreds of thousands of entries. For example, one contest I played had a $100,000 grand prize on a $3 entry fee, but 383,000 people entered. On that last bit, if you’re scoring at home: this means that each individual spent $3 for an expected payout of 26 cents. And that’s not including the possibility that your odds are further depressed by the equivalent of insider trading, a new wrinkle in the fantasy sports world that emerged just this week. This whole one-day fantasy sports explosion apparently stems from a federal law passed in 2006 which cracked down on Internet gambling but somehow exempted fantasy sports and other games of “skill”, opening up a giant loophole which these companies have shrewdly exploited. But the real problem here goes much deeper than any single legislative decision. Deep down, it has more to do with our collective obsession with gambling and all sorts of get-rich-quick shortcuts, and the readiness of businesses and entrepreneurs to feed that obsession. After all, like I’ve alluded to in the past, the retail investment industry often makes nearly the same false promises of wild financial success to its own consumers. The only difference, I’d argue, is that because of certain regulatory and legal restrictions (that is, fear of big fines and lawsuits), financial institutions can’t use such brazen language as their fantasy sports peers. Instead, they convey notions of power and control to individual investors, subtly suggesting that if only they had the right tools, they too could beat the market and rake in fantastic returns. If you want to get a feel for this, take this recent commercial for the online investment brokerage, E*trade. In it, a dopey-looking airline traveler with a laptop waits to board his flight. While watching other airport-goers queue up for an organic-themed food court restaurant, he gets an investment idea. He quickly finds some news about the company online and decides to buy the stock on the spot, using E*trade’s special “browser trading” feature. “Looking below the surface, researching a hunch, and making a decision,” says a delighted Kevin Spacey, narrating in the background (and for some reason wearing a suit from the 1990s). Either the company is pitching the fallacy that its customers can beat the market day-trading on hunches and 5-minute web searches, or simply selling the thrill of rolling the dice. I’m not sure which is worse. Growing up in a Baha’i family, the way we learned about gambling was relatively straightforward. You simply didn’t do it if you were a Baha’i. But there’s a difference between blatant types of gambling like horse betting, for instance, which Abdu’l-Baha once called a “pernicious disease”, and more subtle and ambiguous activities like the lottery, bingo, or raffles. For Baha’is, it is explicitly off-limits to use those types of games to raise religious funds. But like in a lot of other cases, it’s left to the individual believer whether it’s appropriate to, say, play Keno or Powerball. After all, gambling is to a large extent in the eye of the beholder. And this means that, like a lot of things, what’s most important is not hard-and-fast religious rules and restrictions, but understanding the purpose of faith and spirituality. “[B]e content with little, and be freed from all inordinate desire,” is Baha’u’llah’s call, a message echoed by every other spiritual path and holy book. Whether or not it’s called gambling, the broader culture of get-rich-quick schemes seems to be going mainstream. Like a mirage in the desert, that culture — whether in the form of fantasy sports, the lottery, day trading, or whatever — offers up a fleeting daydream of instant gratification, but more often than not ends up giving us no more than frustration and empty pockets. Let’s hope a fresh culture of sensibility, contentment and selflessness might one day meet it head on and take its place. This entry was posted in Advertising & marketing and tagged 'Abdu'l-Baha, Baha'i Faith, Baha'u'llah, Draft Kings, E*trade, Fan Duel, fantasy football, gambling, Kevin Spacey. Bookmark the permalink. ← Am I just another dumb consumer?